Walmart Stores Inc. (WMT - Get Report) is sticking with its strategy of tech investments over adding more stores, a year after closing its $3.3 billion acquisition of Jet.com. Walmart on Thursday, Nov. 16, reported both sales and profits ahead of analysts' expectations, with revenue of $123.2 billion rising 4.2% year over year and adjusted earnings of $1 per share up 2%. Walmart shares rose 5.4% to $94.67 toward record highs. The Bentonville, Arkansas-based company is sticking with the strategy that's gotten it there. "In terms of capital allocation, we're prioritizing e-commerce, technology, supply chain and store remodels over new stores and clubs, which we believe will contribute to long-term value creation for shareholders," Walmart CFO Brett Biggs said on a prerecorded earnings call. Granted, it would be hard for Walmart to grow sales through store growth alone. The company has said that 99% of Americans live within 10 miles of a Walmart store and it can deliver to 87% of Americans with next-day ground shipping and 99% with two-day shipping. But U.S. e-commerce sales rose 50% this quarter, and thanks to the Jet acquisition, Walmart is adding higher-end products to its e-commerce side as it defends against Amazon.com Inc.'s (AMZN - Get Report) grocery incursion. In contrast, Amazon's product sales grew 28.8% during the quarter ending Sept. 30. Food was a particular bright spot: CEO Doug McMillon said on the call that the food business delivered its strongest same-store sales results in almost six years. The company offers online grocery in more than 1,100 stores and plans to add online grocery to another 1,000 stores next year. That focus comes as Amazon digests its $13.7 billion acquisition of Whole Foods, including price cuts. 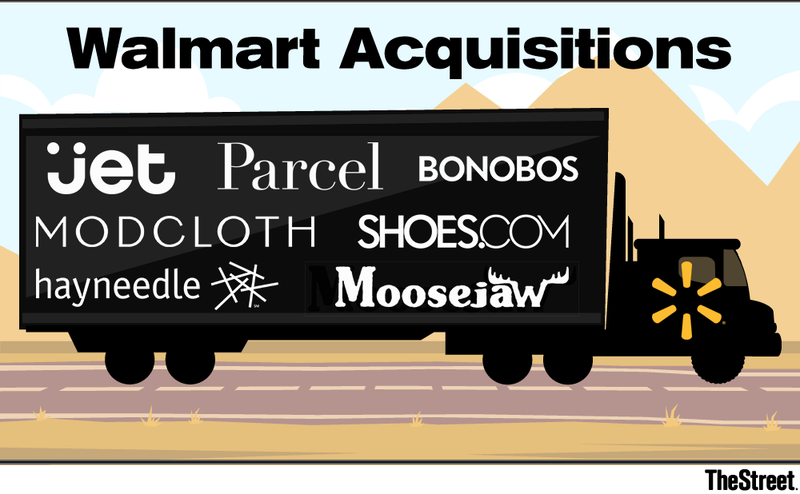 Over the past year, Walmart.com has tripled the number of items for sale to 70 million stock-keeping units (SKUs), McMillon said on the call. The site is also adding "premium brands" like Bose electronics and KitchenAid brand appliances, owned by Whirlpool Corp. (WHR - Get Report) . It also on Tuesday partnered with upscale department store Lord and Taylor, owned by Hudson's Bay Co. (HBAYF , through which the upscale retailer will introduce a "specialized online experience offering premium fashion brands" on Walmart's website and app. The addition of Jet's Uniquely J private label brand and cross-selling opportunities, like offering items from the newly acquired ModCloth on Jet, has "started to attract more premium brands" to Jet, similar to Walmart.com. Jet unveiled Uniquely J on Oct. 10. Jet founder Marc Lore noted that the "more premium" brand would complement Walmart's existing private label brands, including three of the top five largest private label brands in the country and with "many [other] billion-dollar private label brands." "Our take is that WMT continues executing well in a generally solid U.S. consumer environment with the combination of offensive market share gaining moves and defensive inventory and pricing execution," wrote Cowen and Co. LLC analyst Oliver Chen. "Next steps in digital include introducing a new interactive form of everyday low pricing through 'smart baskets' which give consumers an understanding and flexibility to realize additional savings," a strategy Lore honed at Jet. Rivals might be catching up: Sam's Club competitor Costco Wholesale Corp. (COST - Get Report) is beefing up its delivery services, for instance, and its formidable Kirkland private label brand competes against Walmart's more upscale private label offerings. Target Corp. (TGT - Get Report) is focusing on everyday low prices and cutting down on promotions. Kroger Co. (KR - Get Report) is doubling down on in-store experiences and customer retention over delivery. Is Whole Foods Embarrassing Amazon's Deal Team?